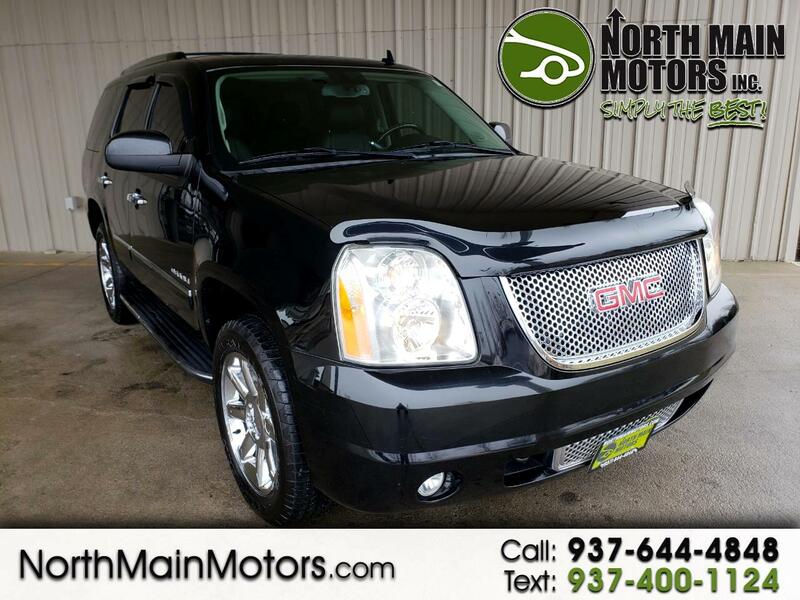 North Main Motors is pleased to offer this fantastic 2013 GMC Yukon Denali In Onyx Black. This vehicle is beautifully equipped with Autoride Suspension Package (Automatic Air Level Control), Denali Package (2nd Row Power Seat Release Only, 2nd Row Reclining Captain's Bucket Seats, Auxiliary External Transmission Oil Cooler, Body-Color Power-Adjustable Heated Outside Mirrors, Color-Keyed Heated Leather-Wrapped Steering Wheel, Front Round Halogen Fog Lamps, Heated & Cooled Driver & Front Passenger Seats, Heated 2nd Row Seats, Heavy-Duty Air-to-Oil External Engine Oil Cooler, Luggage Rack Center Rails, Power-Adjustable Pedals For Accelerator & Brake, Rear Power-Operated Liftgate, Remote Vehicle Starter System, Side Blind Zone Alert, and Universal Home Remote), License Plate Front Mounting Package, Sun, Entertainment & Destinations Package (Inside Rear-View Auto-Dimming Mirror, Power Tilt-Sliding Sunroof w/Express-Open/Close, and Rear-Seat DVD Player Entertainment System), 10 Speakers, 20" x 8.5" Chrome Aluminum Wheels, 3.42 Rear Axle Ratio, 3rd row seats: split-bench, 4-Wheel Disc Brakes, ABS brakes, Adjustable pedals, Air Conditioning, AM/FM radio: SiriusXM, Auto-dimming door mirrors, Auto-dimming Rear-View mirror, Auto-leveling suspension, Automatic temperature control, Blind Spot Sensor, Bodyside moldings, Bumpers: body-color, CD player, Chrome wheels, Compass, Delay-off headlights, Driver door bin, Driver vanity mirror, Dual front impact airbags, Dual front side impact airbags, DVD-Audio, Electronic Stability Control, Emergency communication system, Engine Block Heater, Floor Console w/Storage Area, Front anti-roll bar, Front Bucket Seats, Front Center Armrest, Front dual zone A/C, Front fog lights, Front Full-Feature Reclining Bucket Seats, Front reading lights, Front wheel independent suspension, Fully automatic headlights, Garage door transmitter, Heated door mirrors, Heated front seats, Heated rear seats, Heated steering wheel, Illuminated entry, Integrated Trailer Brake Controller, Leather Shift Knob, Leather steering wheel, Low tire pressure warning, Memory seat, MP3 decoder, Navigation System, NavTraffic, Occupant sensing airbag, Outside temperature display, Overhead airbag, Overhead console, Panic alarm, Passenger door bin, Passenger vanity mirror, Pedal memory, Perforated Nuance Leather-Appointed Seat Trim, Power door mirrors, Power driver seat, Power passenger seat, Power steering, Power windows, Radio data system, Radio: AM/FM/SiriusXM Stereo w/CD/Navigation, Rear air conditioning, Rear anti-roll bar, Rear audio controls, Rear reading lights, Rear Vision Camera, Rear window defroster, Rear window wiper, Remote keyless entry, Roof rack, Security system, SiriusXM Satellite Radio, Speed control, Split folding rear seat, Spoiler, Steering wheel memory, Steering wheel mounted audio controls, Tachometer, Tilt steering wheel, Traction control, Trip computer, Turn signal indicator mirrors, USB Port, Variably intermittent wipers, Ventilated front seats, and Voltmeter! Reviews: * If you regularly need to carry eight or nine people and their gear - and don't want to be seen in a minivan - the GMC easily accommodates passengers and cargo. Those who need serious towing ability will find plenty of it even in lower-trim models of the 2013 Yukon. Source: KBB.com * Seats as many as nine people; stout towing capability; comfortable ride; smooth powertrains. Source: Edmunds From the moment you step on our lot until the time you drive away in your next car, your buying experience with North Main Motors is our number one priority. We encourage you to use the expertise and resources of our sales staff - they are here to help you find the right car at the right price. Call us today at 937-644-4848 to schedule your test drive!